The regime is collapsing, it is dying and in its last-ditch struggle to survive, the king has abdicated. Never has the regime resulting from the Transition [The Transition is the name given to the political process following the death of Franco, which culminated in the Constitution of 1978] been as widely challenged as it is today. The pillars on which it rests, the monarchy, the judiciary, bipartisanship, have been greatly delegitimized for some time now. We no longer believe in their lies, those lies with which they are trying to hold together a system that is falling apart. What seemed not so long ago impossible appears today as a reality. Let us push with all our might to widen even further this breach that the economic, social and political crisis has made possible. Since the elephant hunt of his “majesty” in Botswana, through the indictment of his son-in-law Iñaki Urdangarín in the “Noos affair” and the involvement of the Infanta Cristina in this case, and including the many operations on the monarch’s hip, costing millions and paid out of public funds, the Royal House has become a caricature of itself. One of the main justifications of “democracy” is mortally wounded, but it is not dead yet. The announcement of the royal abdication is a final, desperate attempt to save the regime; an attempt at a ‘facelift’ with the aim of restoring legitimacy not only to the monarchy but also to its suite of judges, politicians and opinion formers. For years, far too many years, they have lived under the shelter of this false Transition, trying to efface or hide our collective history. Our forgetfulness has been the substrate of their victory, not only moral but also political and economic. The economic crisis, transformed into a profound social and also political crisis, has put the king and the regime of 1978 on the ropes. The people have said ‘basta.’ We saw it three years ago with the emergence of the 15-M Movement; with the spread of civil disobedience; with the occupation of empty homes that were in the hands of banks, and all of that with broad popular support despite the criminalization of protest. More poverty means more pain, but thanks to these mobilizations it also means greater awareness of who are the winners in this situation – the bankers, the politicians – and who are the losers. The rising demand for sovereignty in Catalonia has also thrown the regime on the ropes, highlighting the deeply anti-democratic nature of a Constitution that does not allow the right to self-determination. 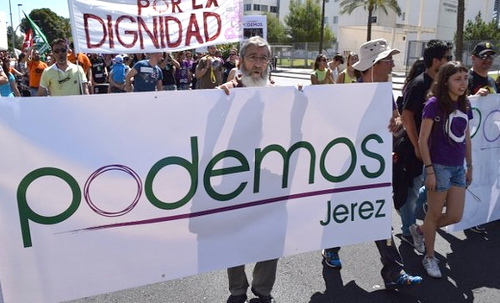 Today, the European elections have given the ‘coup de grace” to a decaying regime, with the loss of more than five million votes for the PP and the PSOE and the emergence, with the election of five members of parliament, of Podemos. The regime is becoming nervous, very nervous. Six years have passed since the ‘official’ start of the crisis, when Lehman Brothers collapsed in September 2008. Four years since [then president Jose Luis Rodriguez] Zapatero announced the first big package of cuts in May 2010. Three years since 15-M (the May 15 Movement) exploded onto the streets. Two years since the large demonstration for independence in Catalonia on September 11, 2012. During this time, the economic and social crisis has morphed into a political crisis and a crisis of the regime. Discontent with the political system has reached levels never seen since the transition [from Franco’s dictatorship to parliamentary democracy in 1978]. The May 25 European elections represent, at a statewide level, the first electoral impact of three years of interrupted, but real and intense social struggle. With a turnout similar to that in 2009 (44.9 per cent then, 44.84 per cent now) it is evident that the two-party system is crumbling at a rapid speed. In 2009, the Partido Popular (conservative Popular Party, PP) won 6,670,377 votes (42.12%) and 24 seats, while the Partido Socialista Obrera Espanol (social-democratic Spanish Socialist Workers’ Party, PSOE) won 6,141,784 (38.78%) and 23 seats. Together, they garnered 12,812,161 votes (80.9%) and 47 deputies. This time around, the panorama is vastly different: 4,070,643 (26.06%) and 16 deputies for PP and 3,596,324 (23%) and 14 deputies for the PSOE. Together, this adds up to 7,663,943 votes (49.06%) and 30 seats, 60% of what they got in 2009. Those times when the two parties alternated in power is over. When one side governed, its support deteriorated, while the other recovered in opposition. Now, both the PP and PSOE, no matter whether in government or opposition, are going downhill. Overall, the crisis of the two-party system is, for now, tilting toward the left. This is worth noting given that across Europe, reactionary forces advanced everywhere. 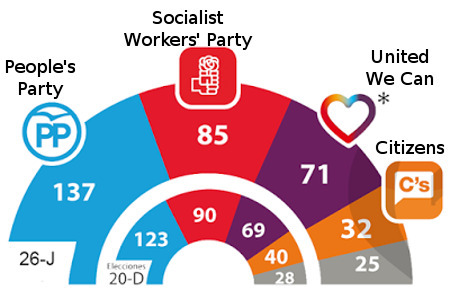 The vote for the left to the left of social democracy in the Spanish state is possibly, together with the vote for Syriza in Greece, the only two bits of good news at a continental level. Source: WikiPedia 2009 results, 2014 results. any noticeable way, despite having increased their vote (1,015,994 votes, 6.49% and four deputies, as compared to 451,866, 2.85% and one seat in 2009). left of the PSOE, Podemos (1,245,948, 7.96%, five seats) and United Left (Izquierda Unida, IU, 1,562,567, 9.99%, six deputies) was 2,808,515 (17.95%) and 11 deputies, not far behind PSOE (3,596,324, 23% and 14 deputies). If we add to this Primavera Europea (European Spring) [an alliance involving Compromis (Commitment) and Equo, the local Greens party] and its 299,884 votes (1.91%), the total becomes 3,108,399 (19.87%). Furthermore, we could also add the 324,534 votes (2.07%) obtained by Los Pueblos Deciden (the People Decide), led by Euskal Herria Bildu (EH Bildu, Reunite the Basque Country) and the Bloque Nacionalista Galego (Galician Nationalist Bloc, BNG). In places like the Community of Madrid, Podemos (248,888, 11.27%) and IU (231,889, 10.5%) outpolled the PSOE (417,993, 18.93%). The PSOE is still a long way from following the trajectory of PASOK [its Greek social-democratic counterpart]. It has not completely rotted out. It will be obligated to make changes and could garner support from unlikely places. But its electoral base has been shattered. With no political credibility left, and unable to offer anything that differs it from the right, it is gradually losing the only strong argument it had left: that it was the only force capable of being an alternative to the PP. Never has the chance to sink this ship been so close. These types of chances rarely come around more than once. 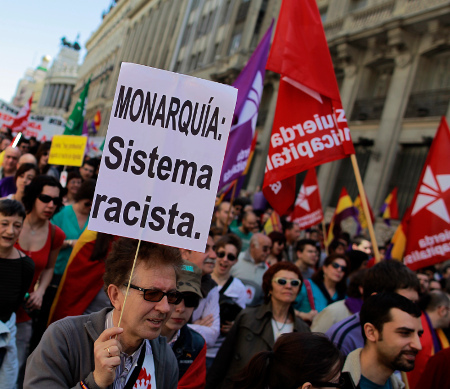 There is no doubt: the sudden appearance of Podemos is the big news at a statewide level. A spectacular eruption both because of its results and what it represents. The purpose of the new formation in the short term is clear: destabilize the political system and open up cracks in the two-party system, given the inability of the traditional left to have done this on its own. Podemos’ success is magnificent news for those who do not feel represented by any of the existing political forces, for those who feel helpless or that they have nothing to hold onto, for those who were convinced that a new player was essential to liven up the game. Something to shake up the flow of the game, that comes in from the sideline and rapidly situates itself in the centre of the field and on the attack. Its emergence will shake up the party game, shifting the entire political map, and all of the left. As of now, Podemos faces a great responsibility. Being the newest force, the most fragile, the least structured, it has a great weight on its shoulders: to not defraud the hopes many have placed in it (it’s not very often that something political enthuses those who are not already part of the active minority!) and continue playing the game it has so brilliantly started. The success of Podemos is also an excellent surprise – and so it should be – for those IU militants, sympathisers and voters who wished their party had a more dynamic way of doing politics, less ensconced in the institutions and more in tune with popular aspirations post-15-M. Podemos will act as a prod that obliges IU to change. This is good news for followers of this party who have received unexpected help from Podemos. Finally, the emergence of Podemos is also good news for those of us who view things from Catalonia (or other nations without states that today belong to the Spanish state). The appearance of a new force at the statewide level with a clear discourse, and a lead candidate who has not been afraid to get his hands dirty, on the issue of the right to decide and the November 9 referendum on Catalan independence, is important news of unimaginable strategic value. The bipartisanship of the PP-PSOE, the ‘PPOE,’ is suffering from a growing crisis that is not only reflected in declining votes but, above all, in a loss of credibility, an inability to even generate illusions among those who continue to vote for them. We should not however, take from this that the two-party system and the political regime has no room to maneuver, nor that the crisis will have a democratic and social outcome. The regime could recompose itself, with a mixture of re-legitimization and authoritarian and neo-centralist involution from above. Alternatively, the political vacuum could end up being filled by demagogic and reactionary alternatives as a form of replacement in extremis if the ‘PPOE’ was to definitively fail. Although this is not the dominant tendency registered on May 25, events in other countries, such as the alarming results in France, show that this danger is always present. disgruntled minority that is not focused on becoming a majority, and instead prefers to narrowly focus on building their own organization. We should not be passive observers of this crisis of the regime. We have to get in the ring without any hang-ups. Always, of course, without losing sight of our objectives, without confusing dedication to become the majority with programmatic dissolution, making sure we don’t mix up audacity with reckless blunders. It is time to work toward gathering an anti-austerity socio-political majority that supports the opening up of a democratic constituent process(es) that ruptures what was bound up by chains of fear in 1978. It is time to act with the dual perspective of unity and radicalism, of will to be a majority… to change everything. To put an end to our interminable and particular ‘nightmare on Elm Street’ of neverending austerity plans, of permanent authoritarian blows and perpetual negation of our basic democratic rights. It is, however, not in our interest to generate false illusions. Cohering a political majority in favour of rupture will be a complex and difficult process, full of marshlands, fake paths, tracks that lead us nowhere and shortcuts that take us backwards. It will require a broad process of alliances and discussions, between different statewide forces and those fighting for sovereignty in Catalonia, the Basque Country and Galicia. Today we can only barely begin to imagine the shapes and forms these will take. We must continue to widen the cracks that have begun to open up. Working with a serene quickness and runaway calm, with a dream-like realism and a rational imagination. The crisis of the PSOE and PP, together with the emergence of Podemos, is a first shake up that can only be understood as a prelude to what’s about to come. May 25 should be ‘the beginning of the beginning,’ electorally speaking. In Catalonia, the mobilization behind the nationalist and pro-independence vote was very important, as the increase in participation shows (47.63% against 36.94% in 2009). We have confirmed the existence of a broad majority for parties in favour of the right to decide. There is no doubt about it. The results show, once again, the impasse faced by the Partido Socialista Catalan (Catalan Socialist Party, PSC), which has no credibility either at the social or national level (358,539 votes, 14.28%, compared with 708,888, 36% in 2009). An exhausted PSC that won less votes than those obtained in the combined good showing for Iniciativa per Catalunya Verds-Esquerra Unida i Alternativa (Initiative for Catalonia Greens-United and Alternative Left, ICV-EUiA, 258,554, 10.30%) and Podemos (117,096, 4.66%). May 25 also reflects the existing equilibrium, one which polls had been predicting since the last election for parliament, between an Esquerra Republicana de Catalunya (Republican Left of Catalonia, ERC) that is affirming itself as the main political force in the Catalonia (594,149, 23.67%) and a declining Convergència i Unió (Convergence and Union, CiU, 548,718, 21.86%). The celebration of the multi-referendum, held alongside the elections but unfortunately disavowed by a Central Electoral Court that continues to be a faithful exponent of the increasingly cosmetic character of our parliamentary democracy, has put on the table a big strategic question in the midst of the independence debate: broaden the right to decide to include all spheres of society. Looking to the future, the proposal formulated by the Procés Constituent (Constituent Process) headed up by Arcadi Oliveres and Teresa Forcades for the next elections, of the broadest possible electoral bloc against austerity and in support of a Catalan republic, begins to resemble, in a strategic manner, the shake up that could see a new political actor emerge in Catalonia with the capacity to influence a dynamic in which the key party of the Catalan right, the CiU, is suffering what appears to be an irreversible decline. And one in which those of us who want to “decide on everything” cannot content ourselves with being spectators or a minor nuisance. 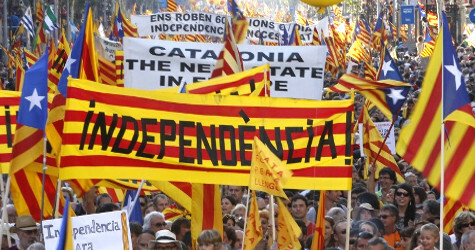 Catalan affair, the independence movement summons together a whole set of political and social-democratic forces that support egalitarian social change of the whole state. The lack of convincing and audible voices supportive of the right to decide at the Spain-wide level has so far been deafening. The discomfort that the issue causes for the Spain-wide left is as understandable as it is strategically blind: if Rajoy is defeated in Catalonia, he will be mortally wounded, as will the regime for which he acts as guarantor. 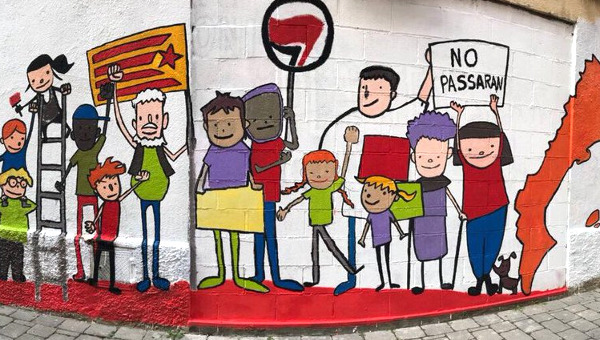 How can we support the Catalan independence movement in a way that does not aid the Spanish right’s ability to cohere its social base but instead helps to break through the dam of the transition? That is the question. forces at the national level (which, moreover, creates an internal pressure toward “patriotic unity” under the leadership of [current president of Catalonia and chairperson of CiU, Artur] Mas); second, political solidarity from the Spanish wide left with the right to decide in Catalonia. There, Podemos could play a key role. we suffered a historic defeat that led to a massive impoverishment of the majority of the population and an anti-democratic involution of the political system. Or alternatively, as the time when we pushed the “second Borbonic restauration” off its tracks. Josep Maria Antentas is a professor of sociology at the Autonomous University of Barcelona and a member of Esquerra Anticapitalista (Anti-capitalist Left) in Catalonia. Translated by Federico Fuentes for Links International Journal of Socialist Renewal where this article appeared. Esther Vivas is a Spanish journalist and activist. This article appeared on her blog esthervivas.com.